Review date: 11 September 2003. 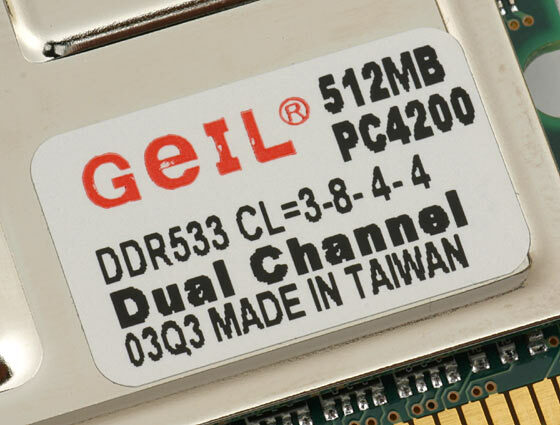 Geil's two-module Double Data Rate PC-4200 1Gb RAM pack, for use in dual channel DDR motherboards (though perfectly compatible with single channel mode), certainly looks the business. 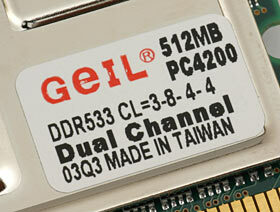 These modules are meant to be able to manage an imposing 533MHz, after DDR doubling, in dual channel mode. Dual channel DDR mode is surprisingly demanding. Just using more than one memory module is well known to pull down the ceiling RAM bus speed you can achieve, in many cases, but dual channel is much worse. A lot of RAM that's fine running at full processor bus speed - 250MHz before doubling, say, for a decently overclocked P4 system - when it's the only module in the system, will probably need to be wound down to 2/3rds of the bus speed to work in dual channel mode. That'll put it well below its rated speed, if it's fancy PC-something-above-3000 memory. But anything faster just won't work. You may be able to load your OS, but good luck running applications. Dual channel is still worth using, though. The lower clock and the bus speed mismatch are outweighed by the performance gain it delivers. But it's really nice if you don't have to wind the RAM down. Fancy matched modules like these ones ought to run fine at full speed, right? This stuff says "Dual Channel" right there on the label, after all. And it comes in a goofy slide-top clear acrylic box! How can it fail? 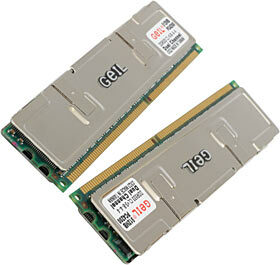 The catch for (relatively) cheap apparently-ultra-fast RAM is always the timings, and so it is in this case. Also right there on the label is notification that you're going to have to use 3:8:4:4 latency timings, for CAS latency, ACT to Precharge, RAS to CAS and RAS Precharge respectively. These are the slowest timing settings possible on my i875 chipset motherboard, but they're not actually a terrible thing. CAS latency matters little for DDR memory; RAS-to-CAS matters more. No memory latency settings have a huge impact for most desktop computer purposes, but all things being equal, it's nice to have faster ones. No problem, though. 3:8:4:4, but full bus speed on my current box running a 30% overclocked, 260MHz FSB? Sold! I'll cut to the chase: These modules didn't do what the label said they would. Well, not in my test box, anyway. I spent actual time doing benchmarks on the PC-3500 Corsair RAM that I was running at 3:2 (which works out at only 173MHz, pre-doubling), and then I put the Geil RAM in and found that it couldn't do any better; I could have saved half an hour. Even at the slowest timings, the Geil RAM couldn't manage 5:4 at 260MHz FSB, much less 1:1. I tried 2.8 volts, 0.1 above the already slightly boosted supply I was using with the Corsair RAM; no go. I'm told that people who've managed to get this RAM to work at its sticker speed needed to use at least 2.85V to do it; my IC7 doesn't go that high, and if your mobo does then it's not a bad idea to install a separate RAM cooling fan, if you try it. Now, it's conceivable that the IC7 I'm using would have a hard time managing 260MHz with a 1:1 FSB-to-RAM ratio with any memory. Other reviewers have noted this phenomenon; other boards with i875 and i865 chipsets seem to work better. But I am using the latest BIOS (which is supposed to have pretty much fixed the problem), and in any case 260MHz at 5:4 should be attainable, if the RAM can take it. The Corsair RAM's currently selling for $AU335.50 per 512Mb module, including delivery, from Aus PC Market here in Australia; that's $AU671 for a pair. The Geil kit is $AU682 delivered. For your extra $AU11, all you seem to get is a silly box and some super-heavy heat spreaders. 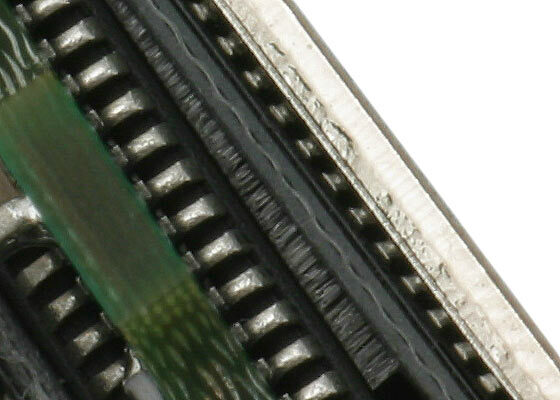 Regular readers will know my previously expressed opinions about SDRAM with chunks of metal stuck on it. To recap: Heat spreaders on non-Rambus memory are very little more than decorations. 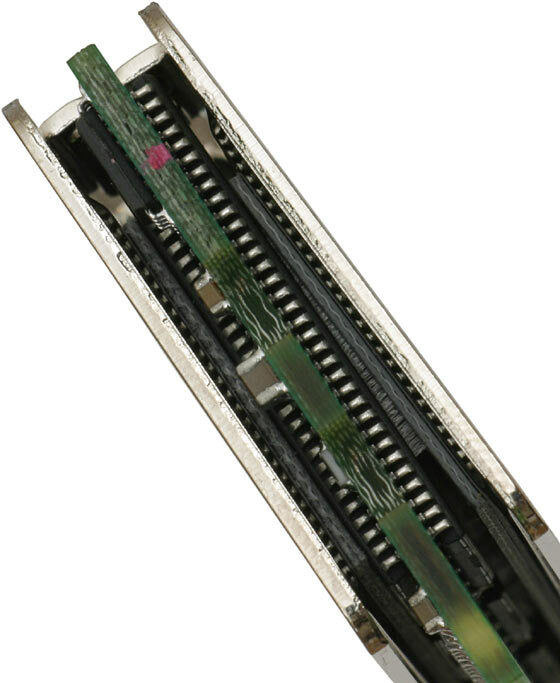 Rambus RDRAM needs heat spreaders, because it can concentrate the whole module's heat output onto one chip for a non-trivial period of time. Regular SDRAM, including DDR SDRAM, doesn't need heat spreaders, because it spreads activity, and heat, naturally. Yes, well-applied heat spreaders can have some small heat sinking effect, that manifests as a minuscule increase in overclocking headroom. But the spreaders are not typically very well thermally connected to the RAM chips anyway. Just ensuring a bit of air flow over completely un-decorated RAM modules is likely to achieve about as much. Eagle-eyed readers (particularly those who click the above picture to see the larger version) will note that something seems to be slightly amiss here. Yep, that heat spreader's not very well stuck to the chip underneath it. The glue's peeling off. Both of the Geil modules I got for review had this problem on one of their heat spreaders. One of them had it badly at both ends of the spreader, and the other had it badly at one end and minimally at the other. Conclusion: One side of the "thermal solution" on these modules isn't doing much but keeping air flow off the chips, allowing them to become warmer than they'd be with no shiny metalwork. In case you're wondering, this doesn't account for their lousy showing in my test; they weren't running long enough to get very hot then, and the side was off the test box's case anyway. Geil don't make very expensive memory products, and the price premium on these modules is accounted for by their extra metalwork and show-off box. And heck, maybe Geil have some other modules that're great; I'll see. I'm also going to try another set of these modules, and I'm going to try them on another motherboard as well, because some people tell me they work for them at their sticker speed. Yes, even in dual mode, and without a ridiculously elevated supply voltage, either. Perhaps the ones I got had had a hard life; that could explain the lousy heat spreader adhesion, I suppose. In the meantime, it seems likely that bigger-brand RAM with a lower nominal speed rating will perform better than the Geil stuff. Aus PC Market have a two-by-512Mb pack of Corsair XMS PC-4000 for $AU715 delivered, and that memory seems reasonably likely to run faster than the Geil RAM's sticker speed, at a mere 2.8 volts. I'm still not nuts about running nominal 2.6V RAM at even 2.8V, but lots of people are doing it and their memory isn't going up in smoke (yet), so it seems to be an OK solution for now. My original conclusion was that Geil's PC-4200 RAM seemed to be stupid show-off rubbish poorly attached to pretty unremarkable RAM, unworthy of more detailed examination. I'll stand by that conclusion, for these two particular modules. Watch this space for more. Aus PC Market don't sell this product any more; you can check out their current RAM range here, and you can also still try a price search at DealTime! A couple of readers have pointed out to me that "Geil" is German (and, I think, also Dutch) slang for "horny", "randy" and/or "awesome" and "exciting", depending on which German dialect you speak. I am uncertain whether this is a good or a bad thing. I've rambled on before about fancy RAM. Check out this, this and this.